Would you rather have a machete so that you could whack off some cactus to get some water, or would you rather have the Aqua Glosses from the Chanel Summer 2016 collection? Would you rather experience a mirage of Ryan Gosling slowly walking shirtless toward you across the glittering hot sand, or would you rather experience a mirage of the Empreinte Du Desert eyeshadow quad from the Chanel Summer 2016 collection glittering in front of you with its four shimmery shades? Chanel, baby girl. Chanel. ALL. THE. WAY. Oh, well! Knowledge is power, yo. Anywho, summer. Chanel. 2016. We’ve got 17 pieces (one quad, two cheek duos, two liners, a mascara, six lip glosses and five nail polishes) with lots o’ warm colors — cheerful corals (YUM), awesome oranges, burnished bronzes and browns, gilded golds and tantalizing tans, sprinkled with a handful of lush, lovely greens. I look forward to Chanel summer all year long and go absolutely goo-goo-ga-ga (to quote my daughter, who is now an expert baby babbler) for it. Thus, I LIVE for these colors. Gimme warm bronze, tan, gold and green any day of the week, babe. If you have a tan, these shades should look amaze-balls on ya. But it’s not just their warmth that draws me to the pieces in this collection. The finishes are also totally on point. 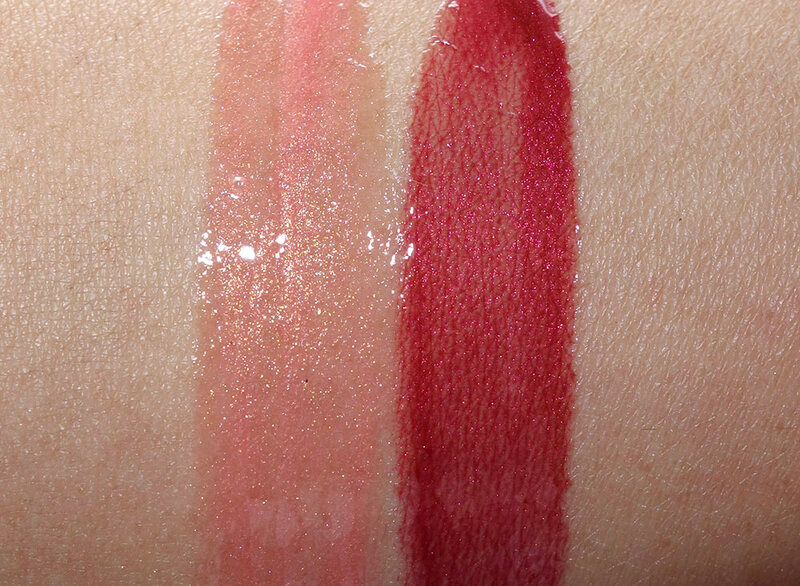 I think Chanel is really good at getting all the way up to the edge with certain finishes, and then pulling back just a little. I think it might…but it’s the best way I can describe their brilliance. Take the quad, for example. 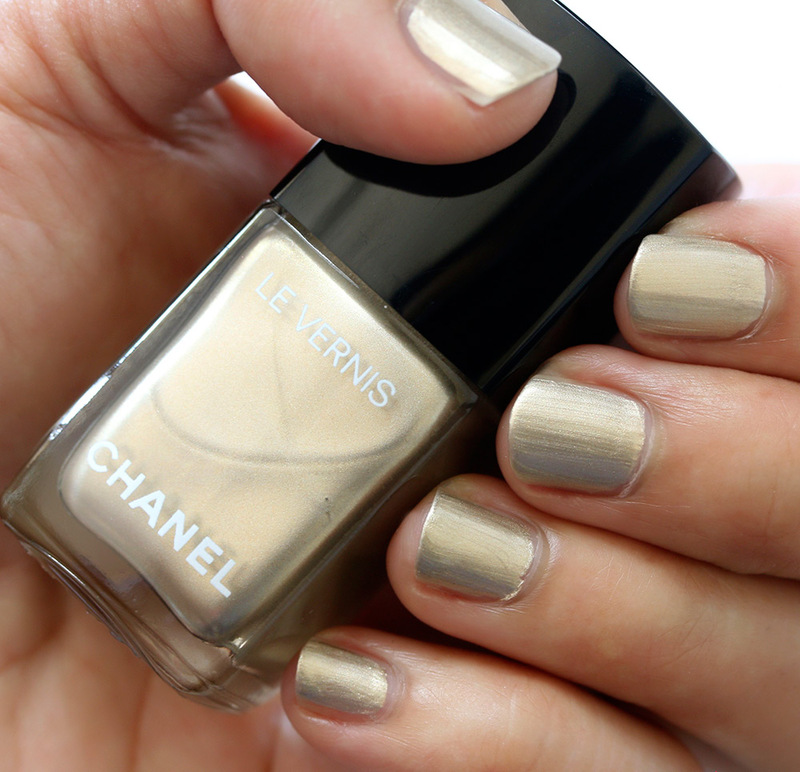 The four shades in it — a bronze, tan, brown and green — all have a good amount of shimmer in them, but Chanel dialed it back just a little so the finish doesn’t go full-on frosty. Even though these are powder eyeshadows, they almost look glossy on the lids. It’s neat, and kind of a dream come true, now that I think about it! 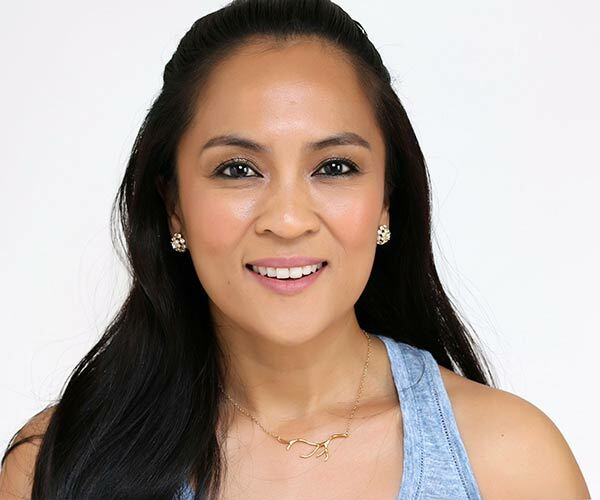 It’s not always easy to wear high-shine shadows like these because they tend to emphasize the fine lines on my lids. Oh, and side note, the wear time on these shadows is totally boss lady. I can pop them on early in the morning, and they’re good until late at night. The two Les Beiges Duos are also beautifully nuanced. They’re not quite matte, not quite satin; they’re somewhere in between. I only need the faintest kitten kiss for lots of rich cheek color. I wear the two duos a little differently. 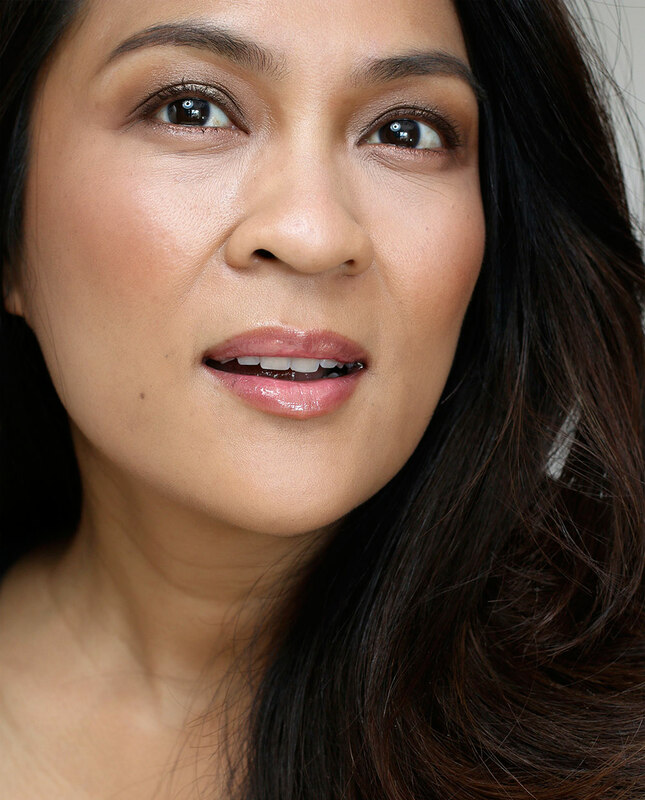 When I want warm peachy bronze cheeks (which go well with bronzy gold eyes like I’m wearing in these pics), I mix the two shades in Les Beiges Duo No. 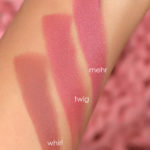 02 together to wear as a blush, but you can also wear the two shades separately, and use one as a blush and one as a bronzer. 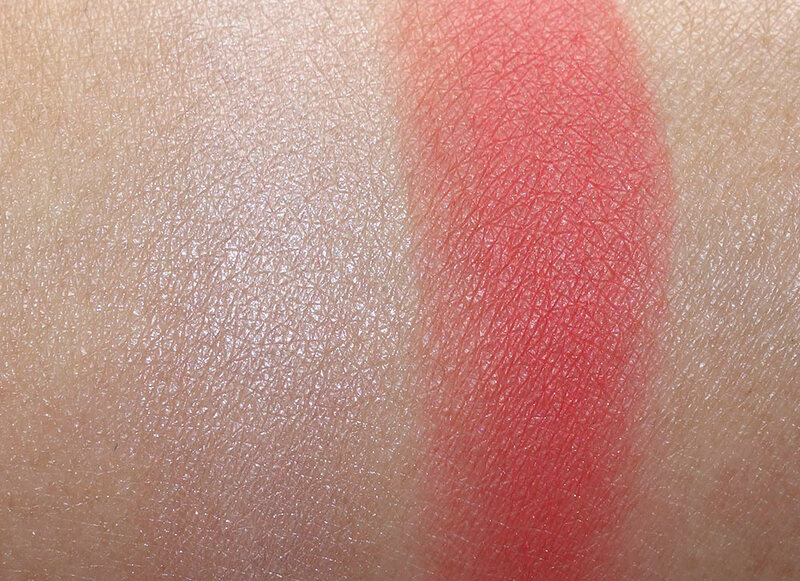 And when I’m in the mood for brighter coral reddish cheeks, I’ll grab Duo No. 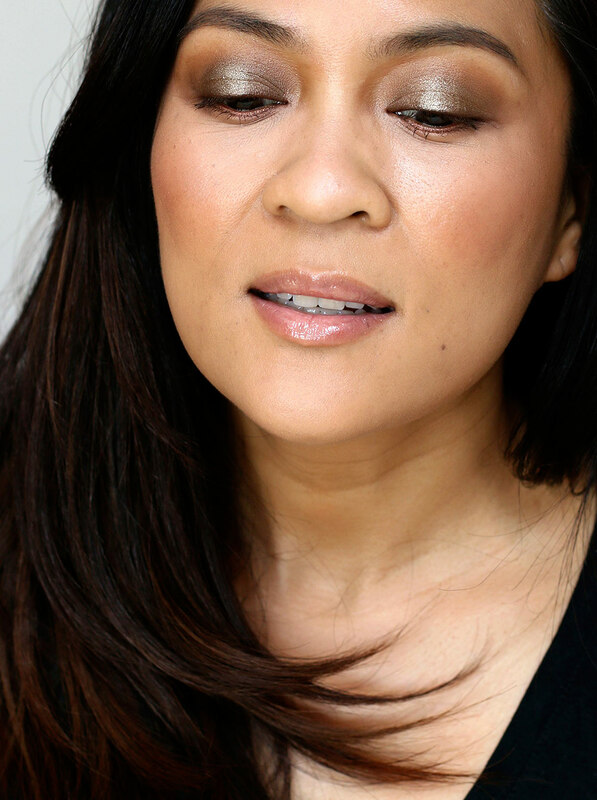 01 and lightly buff the coral onto the apples of my cheeks before highlighting with the light peach shade. Sometimes I’ll blend the two shades together first, though, when I’m in a hurry. Like the quad, both Les Beiges Duos last a good, long while. They’ll go for 8-9 hours on my combo dry/oily cheeks. Oh, and if you’re a Chanel lipgloss gal, don’t skip the glosses. Every time I wear them I get this overwhelming sense of deja vu, because they feel exactly like the old-school (discontinued) Aqualumieres. Remember Candy Glow?? Ugh, SO GOOD. Anyway, the Summer 2016 Aqua Glossimers have a similar non-sticky, smooth texture, and they feel fantastic on mah dry lips. Wear time clocks in at a few hours. 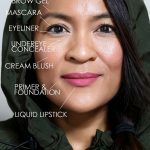 Le Volume de Chanel Waterproof in 27 Mirage — I’m not really into brown mascara, because I feel like, eh, what’s the point? But this one has Le Volume’s trademark thickness and length, which I like, and the waterproof formula does a decent job of holding dat lash curl. So that’s cool! Stylo Yeux Waterproof in Sable — Ooh, metallic coppery shimmery hotness… This should look amazing on blue eyes! 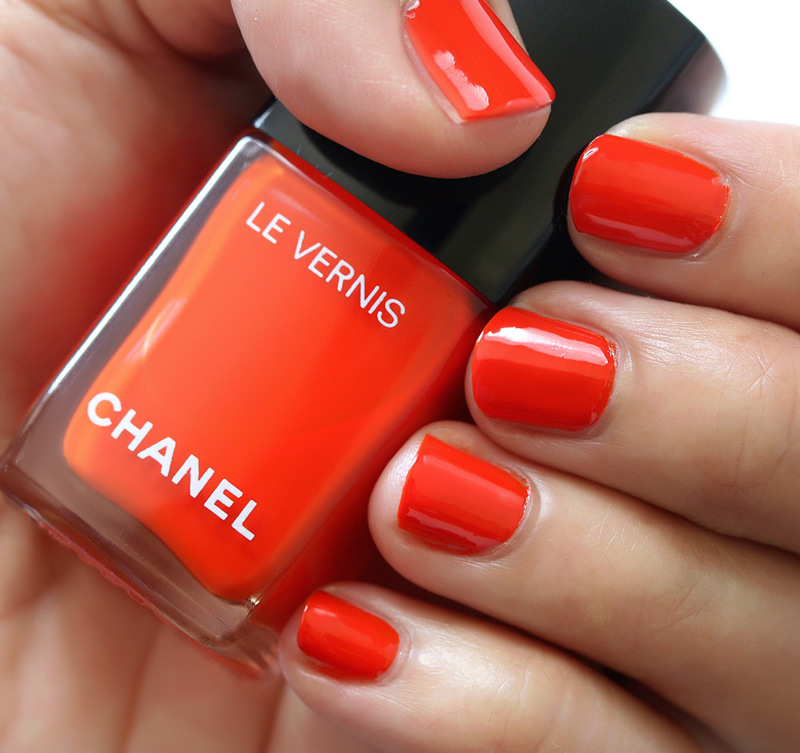 Le Vernis in Espadrilles — This creamy, orangey coral reminds me of a nail polish version of MAC Lady Danger Lipstick. FYI, it’s very pretty on toes. 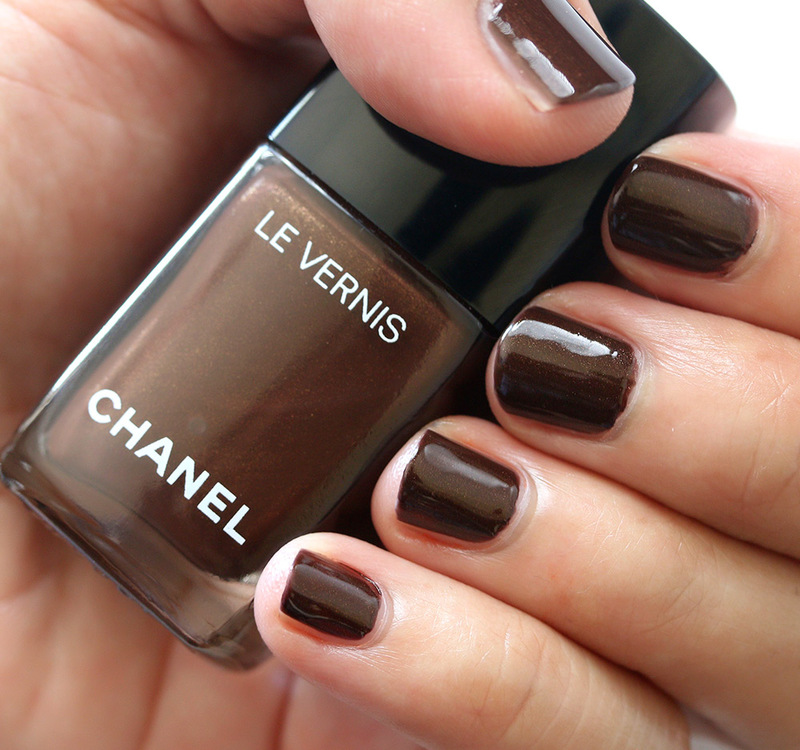 Le Vernis in Cavaliere — I rarely wear brown nail polishes, but next time I do, I think I’ll wear this shade. 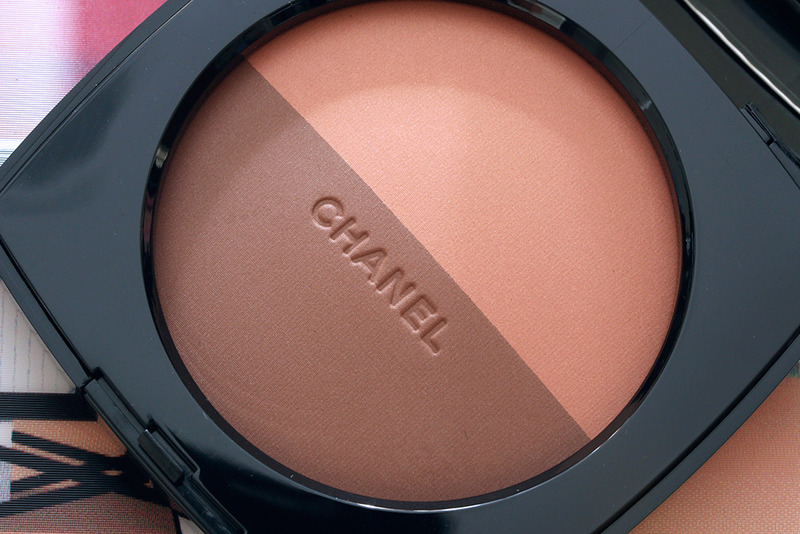 It has Chanel’s signature secret shimmer. 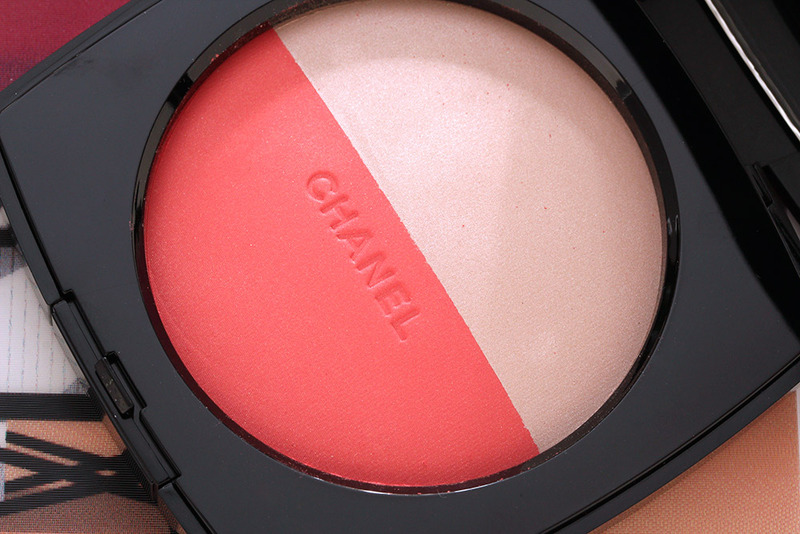 The Chanel Summer 2016 collection should be arriving on Chanel counters and online around June. 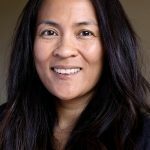 When I have the exact launch date and a full list of prices, I’ll update this post. Hii karen..the goo goo and gaa gaas with smiles are the best! 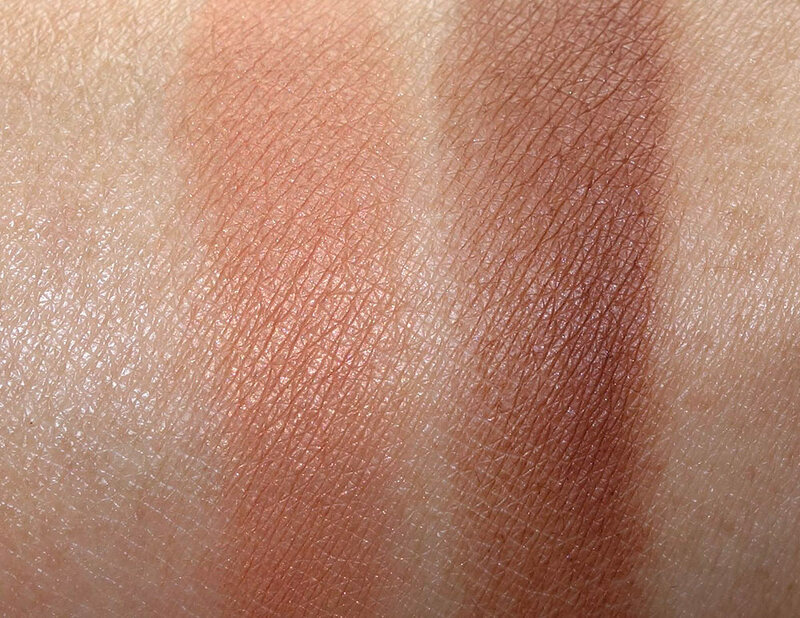 That chanel eyeshadow quad swatches have me drooling n craving..and don’t even wear eyeshadow on a regular basis! The eye look u created looks sooo good.. The nail color canotier looks like a greenish gold to me on ur nails similar to ur eyeshadow look somehow..so unique! Espradille nail color is right up my alley..such a gorgeous color..
*i don’t even .. p.s -sorry for the typo.. i was in a hurry to type before my kids wake up..lol! Maybe I need both lip glosses…. Erin recently posted … Vapid Lacquer Base Coat and Top Coat Review!! I am definitely gonna have to get this collection. Wow! I just don’t know what to get first! That looks like the brown mascara of my dreams! I actually really enjoy brown mascaras because I feel like they make my eyes pop a little more than black. Everything from this collection looks wonderful. That QUAD oh my life. I’m in heaven. And I miss the Aqualumieres too, they were incredible *weeps quietly* I’ll be sure to check these out! 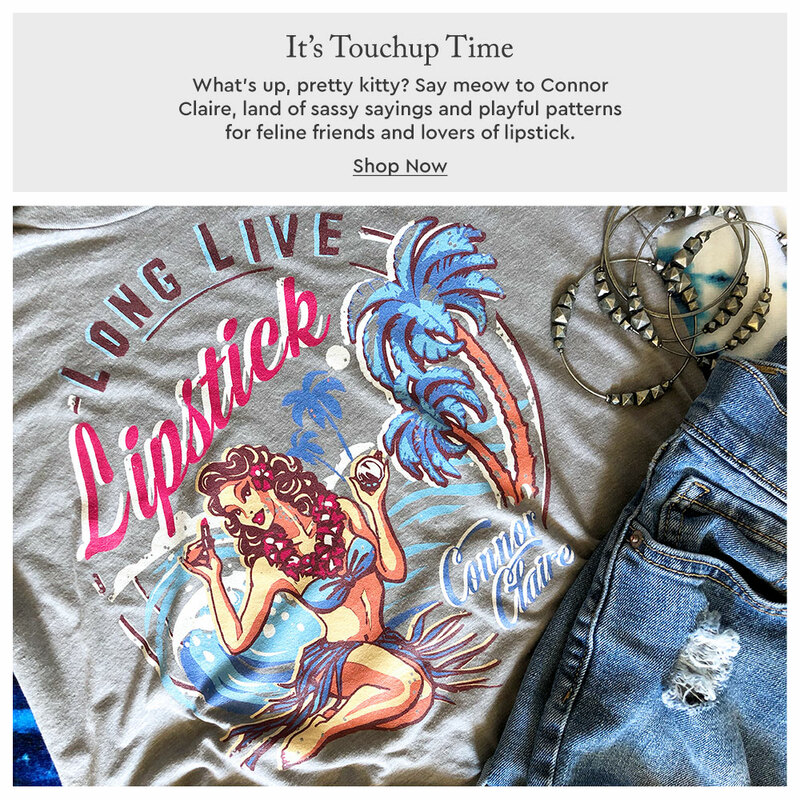 This collection looks like it was made for you! Everything is super flattering, especially that lipgloss Dzhari! 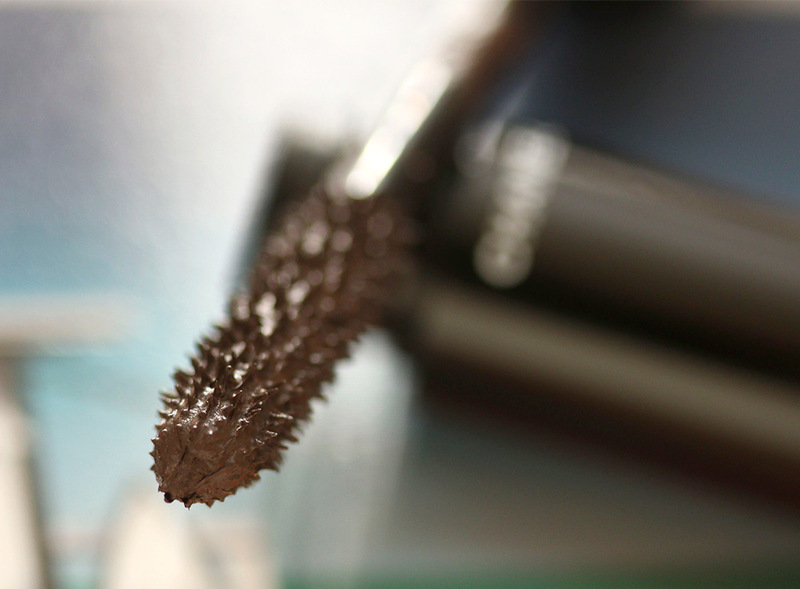 Brown mascaras are beautiful- I hear makeup artists use them for layering. 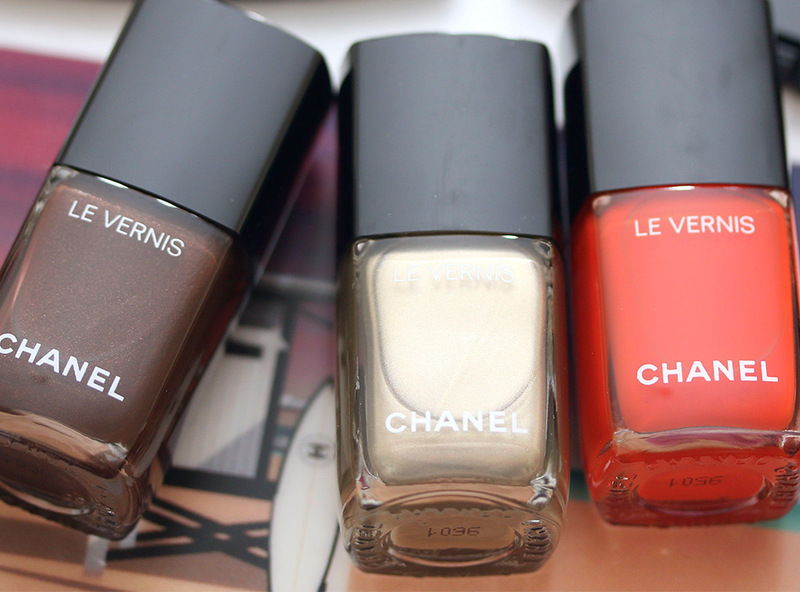 The nail colors look great on you- that is always my favorite part of the Chanel collections. Eagerly awaiting the colors to hit the counter, especially Emeraude. Chanel’s green polishes are always something special. Eee! 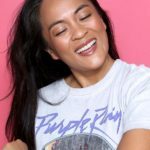 I’m dying over dzhari, it’s such a pretty berry color, and it looks fantastic on you! 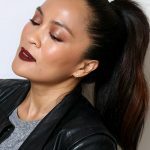 I love wearing deeper or more bold choices when it comes to lipgloss/other sheer glossy products, because I feel less in-yo-face about it than with, say, a matte or even a cream. I will be looking into that ASAP! 🙂 bummed that it won’t be out until June, though, I’m making a Chanel trip tomorrow, actually, and while my wallet is relieved, I would’ve loved to pick some of this stuff up! my only gripe is that the blush might be a bit too coral for me, and the top half of the bronzer a bit too orangey. curses! I had the same problem with the ribbon blusher compact from the spring collections! that chunk of orange really threw the whole thing off on my skin! With the exception of maybe Canotier I lurve everything! 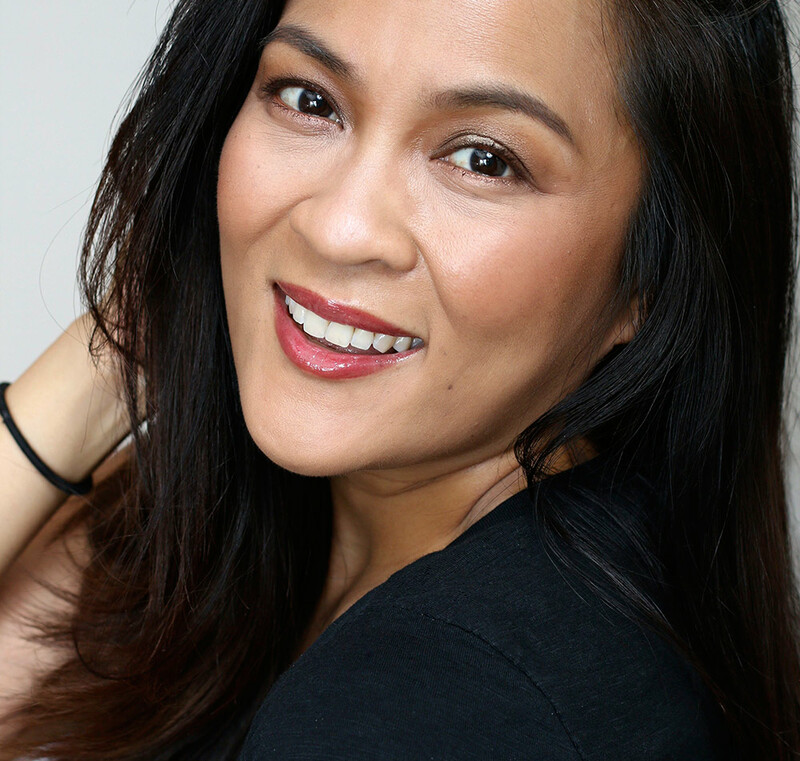 Everything looks lovely on you, Karen! These colors! I´d wear them all year round, they are so pretty. And I have to take your word on finish and texture, because I have never tired a Chanel eyeshadow before, and I don’t think that will change anytime soon. I am trying to make do with my stash for a little while now, I don’t want to add any more before the move in summer. 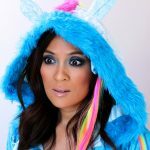 being fond of illuminators and highlighters, I am loving the current trend of luminizing makeup. 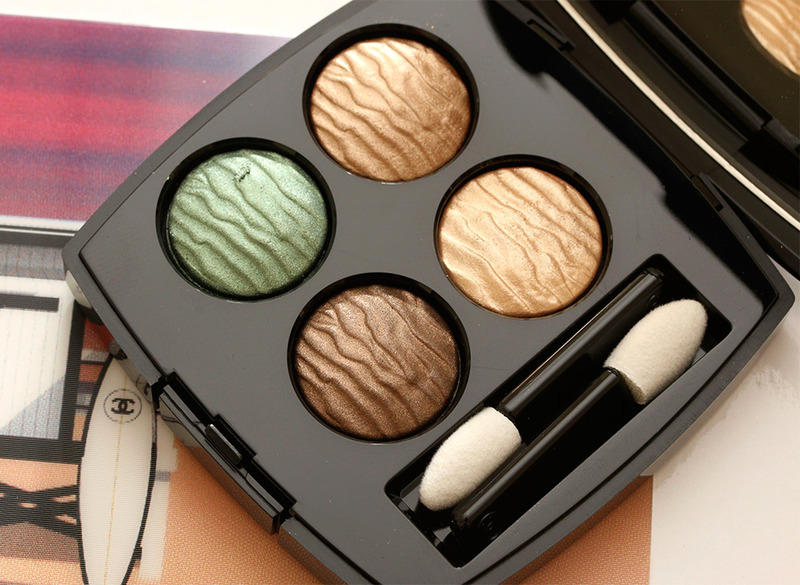 The eye shadow quad the the duos look just like my kind of thing! Too bad have to wait till June. 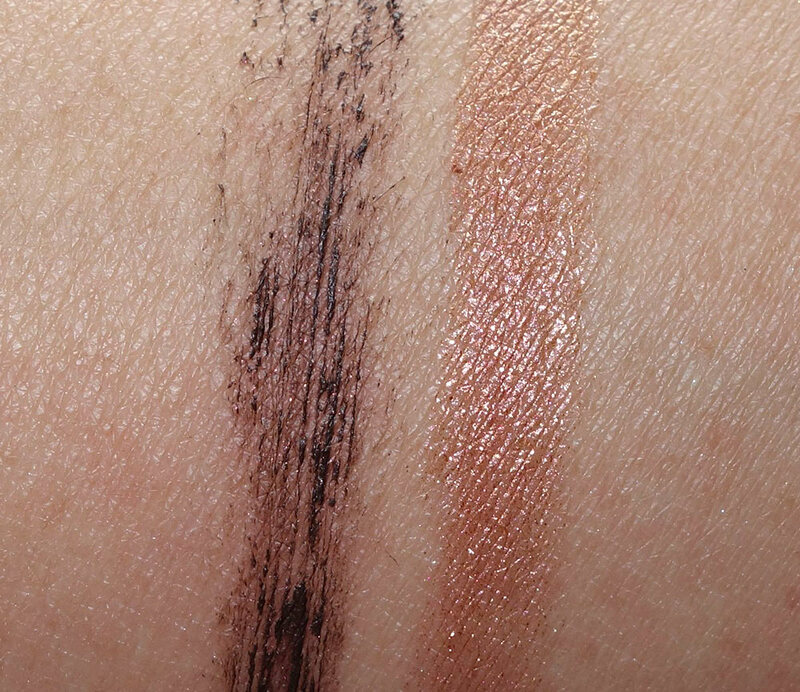 Omg, the eyeshadow quad looks amazing! Not a huge fan of lip gloss but Dhzari is very pretty too. Aaaah Chanel! 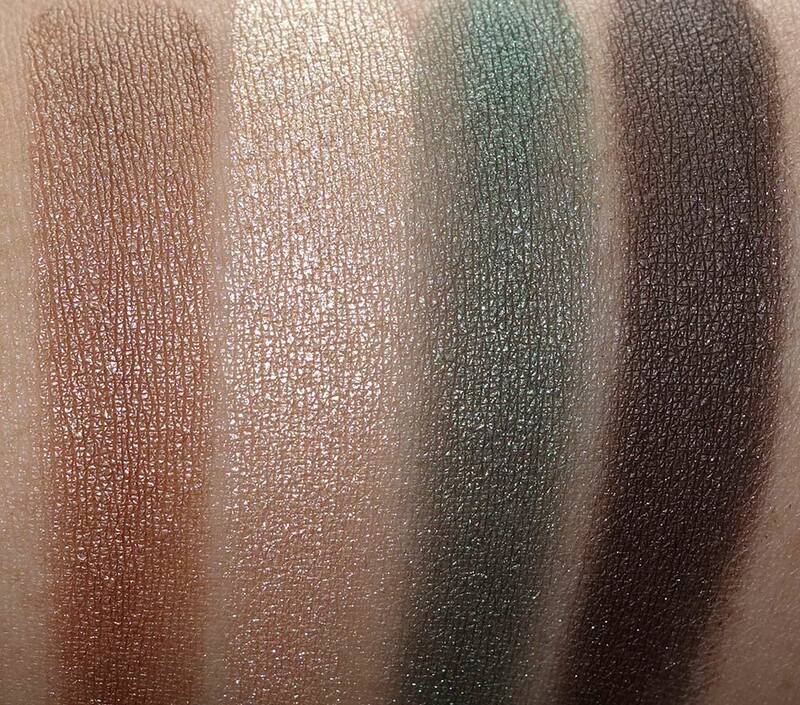 What a gorgeous eyeshadow quad, and the cheek duos are gorgeous! Wow the shadows really look glossy on your lids! It’s interesting and unique, although not my cup of tea. 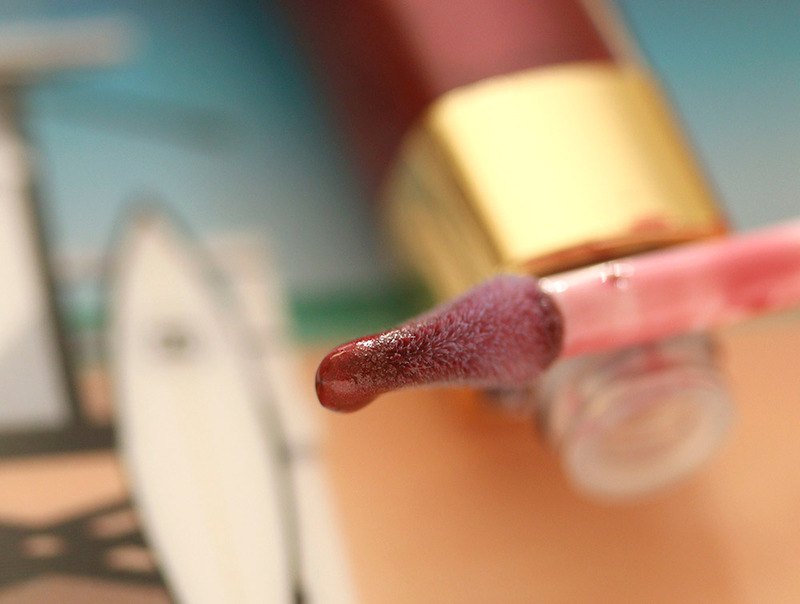 I remember the Aqualumière glosses, they were really good! I need another eye shadow palette like I need a hole in my head. But this one is calling out to me. If I can get only one thing it would be the gloss in Dzhari. I’ve been looking for a shimmery, red, berry lip color just like that. Given how pale I am, I’ll probably give the brown mascara a try, too. Thanks for sharing these tempting photos with us. Looks gorgeous and so sophisticated. The quad is a bit deeper in tone than I thought, and oddly kind of cool toned on you, but I’m still liking the color theme here. I’m liking the lip glosses and Les Beige 1 but everything else might be too brown for me. I might be able to pull off the Les Beige 2 with a light hand. So lovely to see you back commenting! Missed you girl! LOve that quad. Feel in love firts time I saw it online. The Brown nail polish is also gorgeous. I wasn’t interested in the quad nor the styles until I saw your swatches. 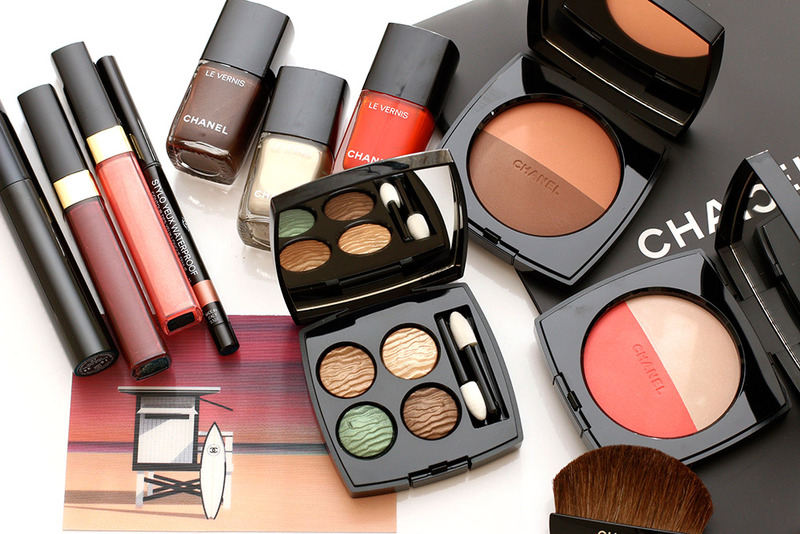 I have a weakness for Chanel makeup, and bought practically the entire Spring collection. The stylo Sable looks lovely, and the quad colors, especially that bronze, is calling my name. I also love that Duo #2, & several of the Glossimers (Adenium especially). Here we go again! Thank you for the swatches – I saw the collection mentioned and was waiting for your review. Happy Mother’s Day, BTW! Enjoy your first one. Excelkent review and swatches, Karen. Your look using the eyeshadow is giving me serious pause that maybe I could wear green after all I love the cheek duos. I wish all 4 came in a compact. Happy Mothers’ Day to you and baby CC! Up Organdi nail polish and it’s so lovely! 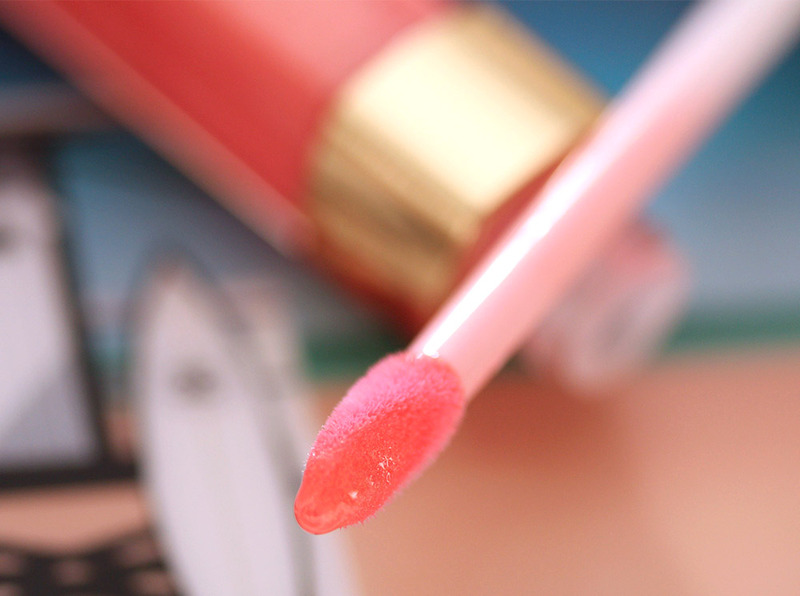 And Malice blush, which is so pretty on. Now I have a huge list of things I want, like one of those glosses, that quad, garçonne nail polish, volume mascara, bunch of lipsticks and coco mademoiselle perfume. I tested it the other day and I could not stop smelling my wrist! Long story short, I’m going to be broke soon. 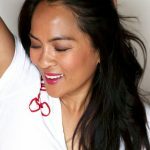 I am a CHANEL Beauty Specialiste at Nordstrom and I love reading your reviews! I also want to inform you that the Perfection Lumiere Foundation is being discontinued and a new long wear full coverage is coming out August so keep your eyes peeled! The Fall collection is designed by Lucia Picca and has a lot of RED! Also for our Nordstrom Anniversary event there will be a CHANEL beauty bag (finally) with an eyeliner mascara and brow powder set.